A new atlas gives a sense of what’s truly happening in America. We look at a few excerpts to see how much we’re driving and what we’re eating. America is a mighty big country. It contains multitudes, and it can be hard to get a sense, sitting in, say, Montana, of what’s happening thousands of miles away in Maine. The Real State of America Atlas by Cynthai Enloe and Joni Seager, released last week, is full of maps and graphics that can help quantify some of how we’re doing as a country. For instance, how is our driving? 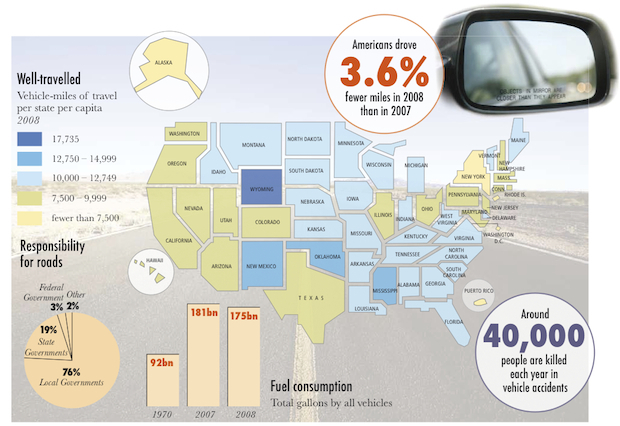 Driving is, as you can see, down from last year, as the recession and high gas prices pinch transportation plans. (Maybe everyone’s taking their bikes and public transportation?) As you can see, states with major metropolitan areas tend to have less driving. In Oklahoma, the non-car options are presumably quite worse. It’s an interesting contrast between states that drive less and states that are fatter. 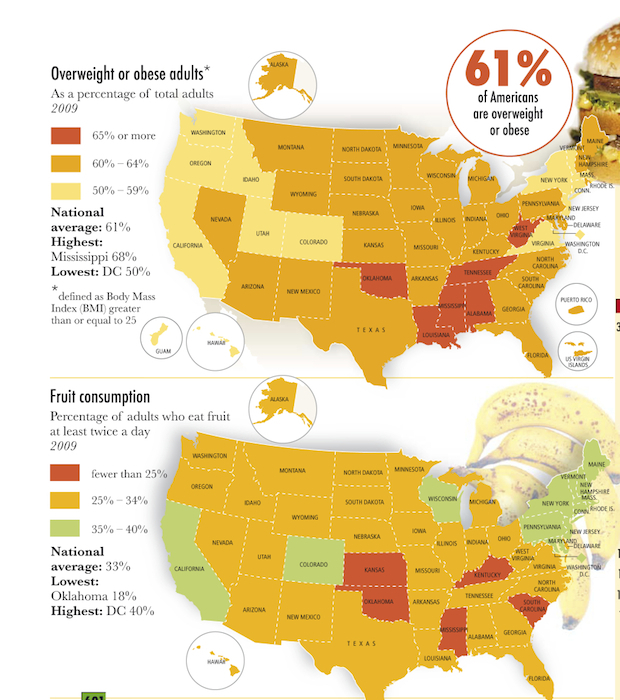 The authors have also included a map of fruit consumption to contrast with this map of obesity. It seems that both driving less and eating more fruit could be related to weighing less. What’s potentially most surprising is how many people in Washington, D.C. are eating fruit, beating even California, where much of the fruit in Washington, D.C. is likely from. This also surely plays into some stereotypes about New England and the Northeast, given how concentrated fruit consumption is. Make your own judgments.